New car interior upholstery will make your auto look very special. Reupholstering the interior of a car with leather or Alcantara is a way to change the factory interior design beyond recognition. The new interior can be made in any color and style, and fulfill your any creative wish. 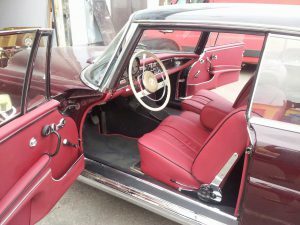 Saleks Grupp OÜ (Tallinn, Estonia) has been offering auto interior restoration services since 2006. By choosing us you choose high quality, affordable price and speedy work. We will professionally recover the roof, walls, door inserts, front panel, dashboard, steering wheel, seats, the floors and other elements of the vehicle’s interior design. What should you choose new car interior upholstery? The main reasons why vehicle owners decide to re-upholster their cars are: to fix wear and tear defects and to alter the factory design. The many defects that can be eliminated with re-trim include: scratches, burns, stains, tears, and more. Once the job is complete, the auto looks like new. This is especially important when selling it – the chances of a quick and profitable sale are much higher with a newly upholstered car. If you want to refurbish your car in order to change the original manufacturer’s design, an exclusive design by professionals can turn any boring interior into a masterpiece. Your car will stand out from other similar models and acquire a unique identity. The most popular modern materials for automotive interiors are: leather and Alcantara. Genuine leather is very durable, it reduces noises and vibration, improves ventilation (due to the “breathability” of automotive leather); it resists chemical agents and fire. 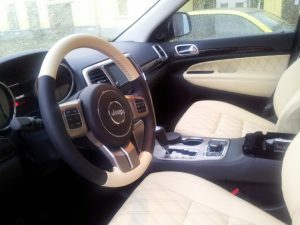 Genuine leather auto interiors look prestigious and luxurious. Alcantara is an interesting modern material that is worth looking into. It is faux suede, which became very popular in the automotive industry. The material blends perfectly with leather and adds elegance and coziness. Alcantara is a durable material with a long service life and excellent properties. It is easy to clean and it does not fade in the sunlight; it is resistant to cleaning agents, abrasion, temperature extremes and mechanical stress. Alcantara is presented in a variety of colors and is cheaper than auto leather. If going half-way is not an option for you, Saleks Grupp OÜ can fundamentally change your automobile interior by performing a complete interior recovering. Our creative experts are ready to turn your auto into a luxurious and comfortable place to be.